There are eight major islands or island groups in this enormous chain… The largest being Sumatra, Java, Kalimantan (Borneo), Sulawesi (Celebes) and Irian Jaya (the Western half of Papua New Guinea)… The smaller islands fall into two main groups, the Moluccas to the Northeast, and the Lesser Sunda chain East of Bali. Indian Muslim traders began spreading Islam in Indonesia in the eighth and ninth centuries... By the time Marco Polo visited North Sumatra at the end of the 13th century, the first Islamic states were already established there… Soon afterwards, rulers on Java's north coast adopted the new creed and conquered the Hindu-based Majapahit in the Javanese hinterland... The faith gradually spread throughout the archipelago, and Indonesia is today the world's largest Islamic nation. The majority of the daily activities for these people were acting as traders between the islands... A simple life yet difficult subsistence living... In recent years more foreign interaction has brought diseases and illness that they had never before experienced... Mix that with a greater reliance for common comforts like electricity and the way of this ancient and unique tribe is slowly starting to disappear... 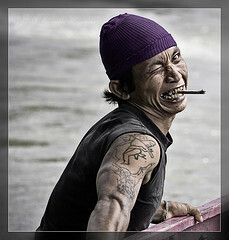 So if you are on the seas of Indonesia and see small man made trading ships pass you by, be careful it just might be the Boogey Man.